The Tōhoku region (東北地方, Tōhoku-chihō) is one of Japan's traditional regions. The Japanese conventions of geography and history divide the nation into eight regions, including the Tōhoku region. These have been used since 1905 as basic units for description and comparison and as cultural markers. The regions of Japan are a fusion of historical divisions and modern administrative needs. The significance of the region in Japan is geographical, cultural and administrative. In the late 7th century, the Tōsandō region were identified as one of the eight largest administrative areas of the Imperial system (ritsuryo seido). 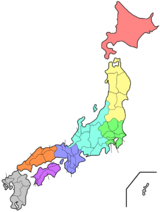 Gokishichidō is an ancient system of names for parts of the country, including Tōsandō. Tōhoku covers the northern area of the island of Honshū in roughly the same area as the traditional Tōsandō. In the Meiji period, the modern regional system was made by Imperial decree. Japan was divided into regions (chihō), including the Tōhoku region. A regional council (chihō gyōsei kyōgisai) was headed by the governor of the most powerful prefecture in the regional grouping. The council also included regional chiefs of central government ministries. Over time, Tōhoku has developed its own regional dialects, customs and unique traditional culture. Tōhoku is famous for farming. Now a lot of kinds of vegetable are grown. The Tōhoku University was built in 1907. In 2011, Tōhoku was struck with a very strong earthquake and tsunami. It caused a lot of damage. Now, people in Japan do their best for the complete revival of Tōhoku. The region occupies the northeastern part of Honshu, which is the largest Japanese island. ↑ Nussbaum, Louis-Frédéric. (2005). "Geography" in Japan Encyclopedia, p. 242; "Tōhoku" in Japan Encyclopedia, p. 970. ↑ Nussbaum, Louis-Frédéric. (2005). "Tōhoku" in Japan Encyclopedia, p. 970. Wikimedia Commons has media related to Tōhoku region.